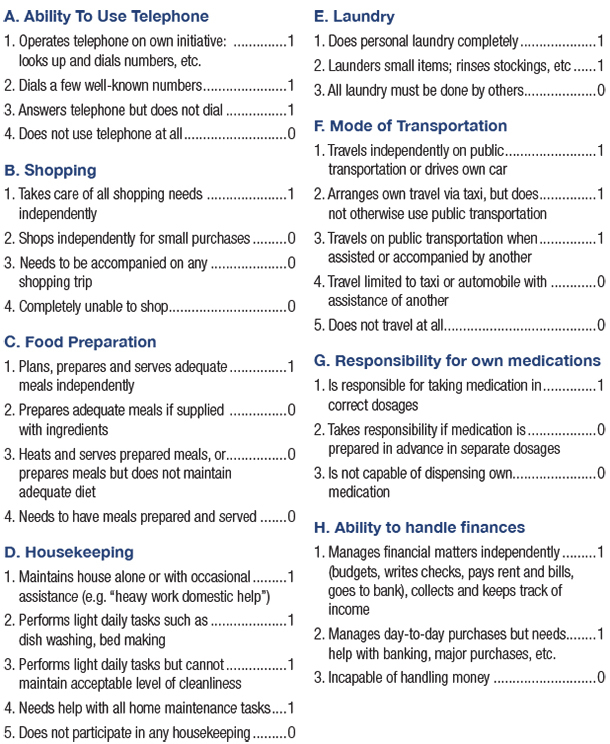 This self-assessment tool was developed by M. Powell Lawton and E.M. Brody. The scale measures Instrumental Activities of Daily Living (IADLs). A person’s ability to perform these activities is often lost before their ability to perform simple activities of daily living (ADLs) such as bathing, toileting and eating. Instructions: Choose one answer and corresponding score per category. Pick the statement that most closely represents how the individual usually performs the task. Scoring: Add the total number of points scored in all categories A-H. The score will range from 0-8. The lower the score, the more an individual will need outside assistance to remain at home safely. Source: Lawton, M.P. and Brody, E.M. “Assessment of older people: Self-maintaining and instrumental activities of daily living.” Gerontologist 9:179-186. (1969). "You and all your aides and staff were wonderful. Health Force is an excellent home care service and I would certainly recommend your service. "